Roller blinds is a true design gem, combining unmatched functionality and decorative properties. They can decorate almost any interior, because it can be placed on Windows of any type, including sloping attic Windows. We will explain how to install roller blinds on their own. The main difference between blinds from blinds other type is that the fabric curtains when you minimize retracts into the coil, which in turn in some models can be in a special box located at the top. The box also can be decorated in tone, for example, the walls. 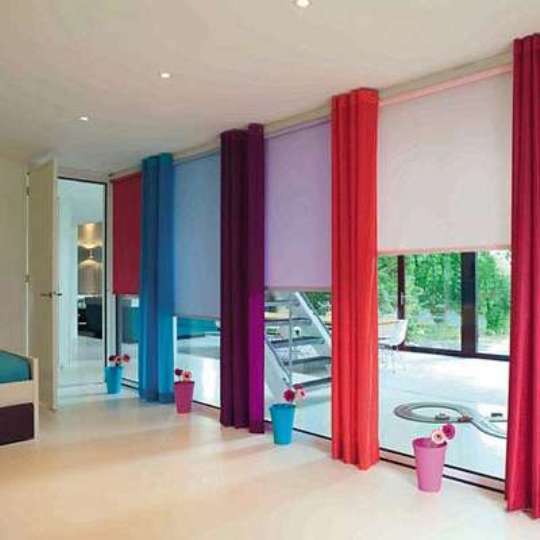 Roller blinds can be mounted in-wall, in-ceiling, in the window aperture and the window frame, sash. To install the curtains will need a drill, dowels and screws, screwdriver, ruler, level, and measuring tape. Pre-decide how it will be curtains: inside the window opening, outside of it or on the leaves of the window. Next, remove the size. In the first case, the width of the blinds is equal to the width of the window opening minus 2 cm on each side. The height of curtains should be at least the height of the window opening minus 2 cm. In the second case, the width of roller blinds is equal to the width of the window opening plus 5 cm on each side. In the third case, the width of the blinds is equal to the width of the glass plus 1.5 cm on each side. Please note that blinds should be placed in such a way as not to interfere with the movement of the window handle. If the window is flush with the wall, the width of the blinds is equal to window width plus 10 cm on each side, so the room will be better obscured. The height of the curtains in the second, third and fourth cases should not be less than the window height plus 10 cm. Next, begin by installing the aluminium tube on which is wound a cloth curtains. To do this, measure the same distance from each edge of the window and mark the position of the first attachment. Then drill the wall, insert a dowel that matches the material of the wall and screw the mounting screws. Using a level and ruler to mark the position of the second mount and screw it in the same way. Place additional fastening at a distance of 10 cm from the regulating cord, since the mechanism of roller blinds is experiencing the greatest load. After that, attach the curtain on the mounts. Be sure to consider the type of premises that will host the blinds to make the care curtain of light, and the use of simple.